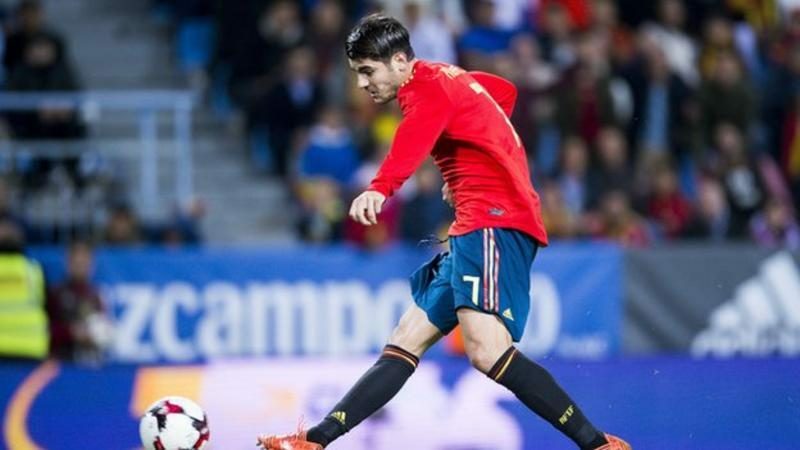 Chelsea striker Alvaro Morata has not made Spain’s 23-man World Cup squad. The 25-year-old scored 11 goals in his debut season at Stamford Bridge and was a last-minute substitute in Saturday’s FA Cup final win. Julen Lopetegui has named four Premier League players in his squad, with David De Gea, David Silva, Cesar Azpilicueta and Nacho Monreal all included. “Including four players up front was not something we wanted to do,” said manager Lopetegui. Spain begin their campaign against Portugal on 15 June in Sochi. Former Real Madrid striker Morata last played for the 2010 world champions in November 2017 when he scored once in a 5-0 win over Costa Rica. Despite his omission from the squad, the striker has taken to Twitter to wish his countrymen “lots of luck” in the tournament. Morata’s Blues team-mates Marcos Alonso and Cesc Fabregas join Arsenal defender Hector Bellerin in also missing out on selection. There is room, however, for Morata’s predecessor at Chelsea, with Diego Costa named among the strikers travelling to Russia. Real Madrid and Barcelona supply 10 players between them, with veteran Barca midfielder Andres Iniesta included following his final appearance for the Catalan giants on Sunday.